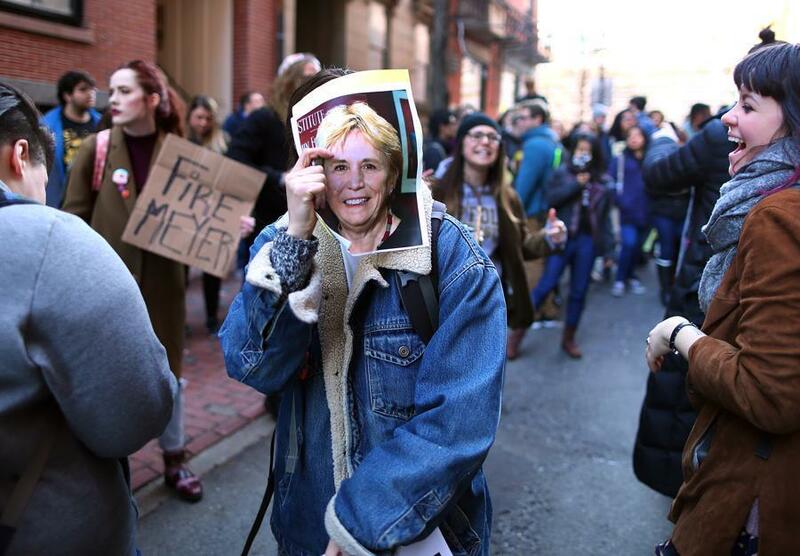 Students rallied earlier this week outside the C. Walsh Theater of Suffolk University in support of president Margaret McKenna, who had been under fire to resign. 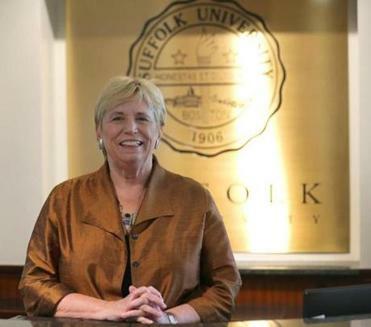 Suffolk University president Margaret McKenna and board chairman Andrew Meyer struck a deal Thursday in which McKenna would keep her job, at least for now, according to two people familiar with the plan. The deal is intended to resolve an ugly feud over a board attempt to fire McKenna seven months into her tenure. Neither side of the dispute would give details of the new arrangement Thursday, but a vague statement from a school spokesman also suggested McKenna will survive. “President McKenna and chairman Meyer have heard the voices of the members of the Suffolk community, as well as members of the wider community who care so deeply about the future of Suffolk University,” the statement read. Those voices — students, faculty, alumni, business leaders, and Mayor Martin J. Walsh — have overwhelmingly backed McKenna this week, as the unusually public spat has snowballed into a painful media drama for the downtown university. In a letter, business and civic leaders urged the university’s board to use an independent mediator to resolve its differences with Margaret McKenna. Two dozen civic and business leaders on Thursday jumped into the dispute, urging the board to mediate any differences with McKenna, rather than fire her. The Suffolk University Student Government Association added its voice later in the day, siding with McKenna, bluntly expressing “no confidence” in Meyer, and calling for his resignation. Details of the proposal were still being finalized Thursday afternoon and remained subject to approval by the board, officials said. The board announced earlier this week that it would meet Friday to vote on McKenna’s termination. A trustee told McKenna last week that the board had enough votes to oust her; they accuse her of making unauthorized expenditures and hires, and of having an “abrasive’’ manner. McKenna later offered her own point-by-point rebuttal. On Thursday, Meyer released a cryptic statement, saying he had been “working in good faith with president Margaret McKenna to iron out the issues before us,” and confirmed McKenna and he would present a proposal to the board Friday. In addition to generating a week of unrest and withering criticism, the move to fire McKenna has attracted the attention of regulators. State Attorney General Maura Healey’s office said Thursday that it wants answers from Suffolk over reports that its board ignored instructions from a regional academic accrediting agency to address the school’s governing structure. It is part of Healey’s job to ensure that trustees on nonprofit boards uphold their fiduciary duties. “There have been a number of issues raised over the last week about the way in which the board of trustees uses its authority,” said Healey spokeswoman Cyndi Roy Gonzalez, in a statement. Healey’s office said it is concerned about reports that the problems with the school’s governance cited by the accrediting agency have gone unaddressed for years. “We have questions about the board’s course of action since those problems were identified,” she said. The Globe reported Wednesday that Suffolk trustees have not followed instructions from the New England Association of Schools and Colleges, which told the board in 2014 to update its bylaws and reform its governance structure to clarify the relationship between the board and the administration. This week, the accrediting agency also demanded an explanation from Suffolk. If the school were to lose its accreditation, its federal financial aid dollars could be put in jeopardy. The Suffolk Student Government Association and a new alumni group opposing McKenna’s dismissal held a joint press conference Thursday blasting Meyer’s leadership and calling for his removal from the board. “If you lose the confidence of one of the biggest constituent groups, how can you effectively lead the university?” the association’s president, Suffolk senior Colin Loiselle, said to reporters. Loiselle noted that the school is on its fifth president in five years, including two interims and longtime president David Sargent, and blamed Meyer for the instability. “These presidents have come and gone . . . the only thing still constant is chairman Meyer’s leadership,” he said. Loiselle praised McKenna as a “very accessible” administrator, who frequently attends student activities and is quick to respond to student body concerns. “It’s refreshing to have a president that does care so much about students on campus and I think that’s why you are seeing such tremendous support for president McKenna,” he said. He attributed the friction between McKenna and trustees to McKenna’s willingness to challenge the board’s authority. Also on Thursday, members of a new alumni group on Thursday delivered a list of demands in a meeting with two Suffolk board members, William Hogan and John McDonnell, according to Jared Cain, a 2008 Suffolk graduate. Cain is a spokesman for the group, Alumni for the Integrity of Suffolk University. The group wants Meyer and his executive committee to step down, along with any trustees with business connections to George Regan, the public relations executive who has a $300,000 contract with the school. Critics of the board have suggested Regan wields strong influence over board decisions.